Ever wondered how the dreidel came to be a Chanukah pastime? 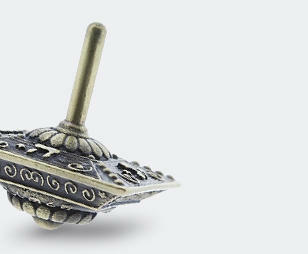 Turns out — pun intended — that the spinning top has a very long history. It probably didn’t start out as a Chanukah creation, but does date back from ancient Greek and Roman times, possibly, just possibly during the Hasmonean dynasty, which was when the story of the Maccabees and that never-ending jug of oil took place. But that’s not necessarily when the spinning toy joined the Chanukah celebrations. During those times, when Jews were not allowed to study Torah according to Greek law, they reportedly playing with a spinning top, which was a wooden block decorated with images of Venus and Saturn. While they played with the popular game, they would recite the Torah orally, still learning, of course, but appearing to be gambling, instead. It’s all about appearances, folks. Within a few centuries, the popular top was brought to England by Roman solders and was made with Latin letters on all four sides, each letter representing the rules of the game: Take from the pot, put into the pot, nothing, and take all. Guess what? The game became popular at Christmastime and eventually arrived in Germany, which is where Jewish kids reportedly adopted it for themselves as a Chanukah game, changing the English letters to Yiddish and then Hebrew. Chances are, it was a more acceptable Christmas custom to take for their own than a Christmas tree, or some of the other holiday traditions. The concept of the game remained the same, with G representing the Hebrew letter gimmel, meaning ‘take all’; N for nun, ‘take nothing’; H for hey or ‘half’; and S for shin, or ‘put in’. At some point, the Chanukah story entered the annals of the game, and the top’s initials were changed to Nes Gadol Haya Po, with po for ‘here,’ in Israel. The game still gets played on Chanukah, whether you’re playing with ‘sham’ or ‘po,’ and real Chanukah gelt or a pile of chocolate chips. And while there’s more than one app out there for playing dreidel on the smart phone or iPad, there’s nothing quite like sitting on the floor with a dreidel and a pile of gelt for the taking. Making dreidels has become part of the shtick, whether shaping it from silver, like artist Gideon Hay, who has created a large collection in his Jerusalem studio, and gave one to astronaut Jeffrey Hoffman, who took it into space, or artist Yael Falk, who crochets dreidels from colored copper wire in a technique that combines crocheting and knitting, what she calls invisible spool knitting. 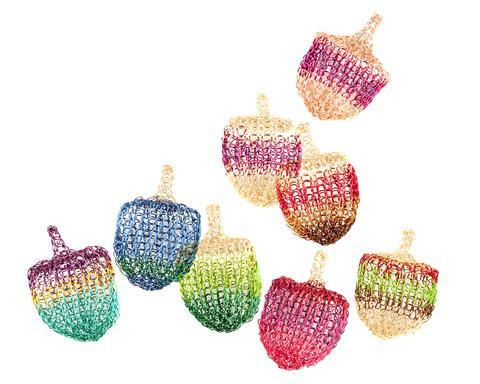 Her small, delicate dreidels are available at local museum shops and online at Etsy; she also invites crafty types to download her PDF and make their own. One San Francisco artist made a Dr. Dre dreidel, laser etching images of the rapper on all four sides of a wooden top, using a bit of wordplay to replace the original working. At the Israel Museum, there are collections of dreidels — and menorahs — from the world over, perfect for a quiet day of viewing during Chanukah. They also made a giant dreidel out of dominoes, during a recent Chanukah. And the nerdy engineering types at the Technion used the moon as their more slowly revolving spinning top, reflecting an image of a menorah — or hannukiah, as it’s called in Israel, on its orbiting, astronomical body. It’s the top, that never stops. The Ramon Crater is a bit off the beaten path but it offers incredible natural beauty, wildlife, archaeology and spectacularly clear skies which make it well worth the detour.